It’s likely you’ve had one of their smoothies before and chances are you’ve noticed them on social media as well. We’re talking about innocent drinks, the British drinks brand that manufactures smoothies, coconut water and other things helping people get their five-a-day. Furthermore, innocent’s social media presence is a prime example for brands doing social media marketing right. The innocent social media accounts are full of puns and dad jokes, comments on the British weather, and intentionally thinly veiled marketing messages with a sense of humour. You check Twitter one last time before bed. "PLEASE BUY SMOOTHIES", it says. You buy loads of smoothies. 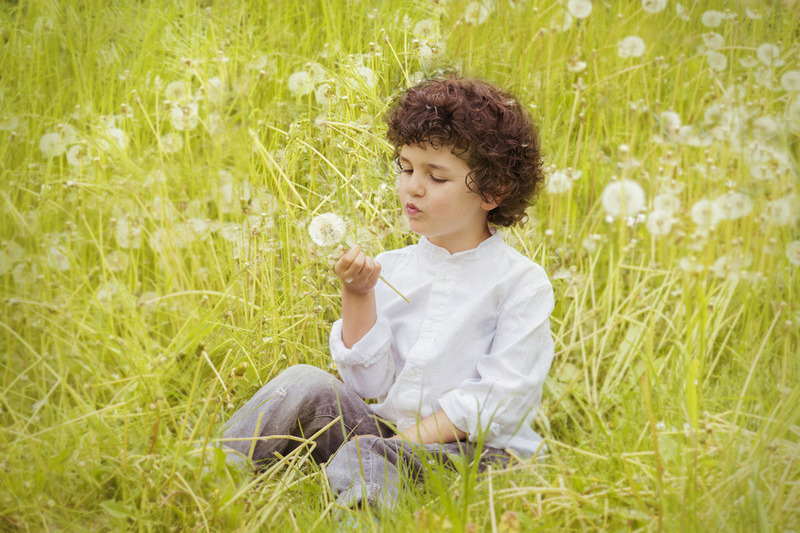 Part of innocent’s quest for healthier diets is the innocent Sow & Grow campaign. First launched in 2016 and returning in 2017, the campaign aims to teach children to love healthy food by showing them how to grow it themselves. The 2017 campaign rolled out in more than 6,500 schools in the UK and Ireland. innocent sent these schools growing pots, seeds and soil and also gave away 5,000 seed packs to individuals who’d outgrown school but wanted to grow their own veg at home as well. The campaign was accompanied by a well-planned hashtag campaign on social media, encouraging people to share their Sow & Grow photos and videos. Each week, innocent crowned the winning entries — including one overall winner becoming the Sow & Grow School of the Year — and handed out prizes. 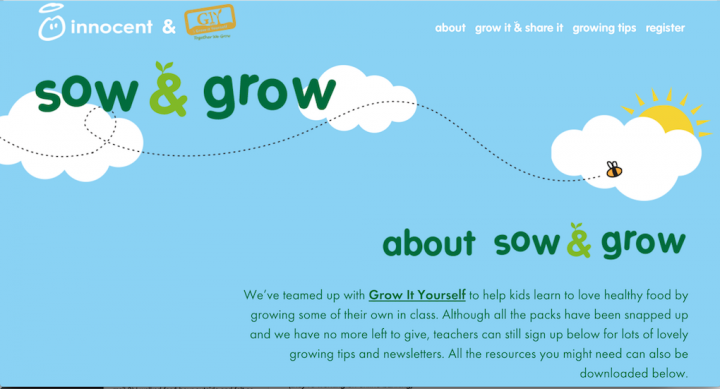 As a hub for the whole Sow & Grow campaign, innocent created a campaign microsite at innocentsowandgrow.com. The campaign site functions as a one-stop shop for the campaign. It informs visitors about the campaign, how they can get involved and lets them register their schools. The campaign site also has a dedicated section for downloadable resources and guides. And, of course, the social media walls are embedded on the microsite as well. innocent created a microsite for the Sow & Grow campaign, providing onboarding information, social media content and the option to register straight away. 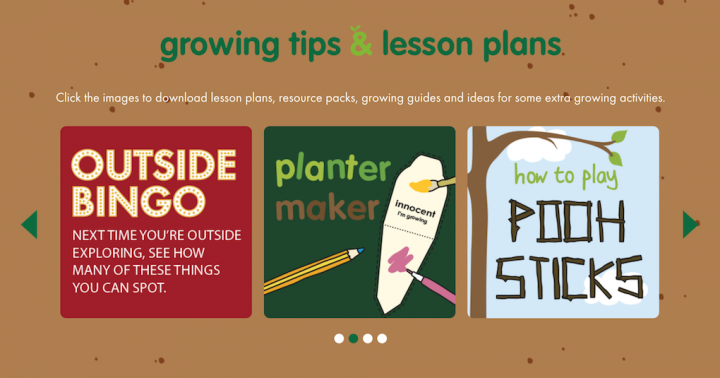 The resource section of the Sow & Grow campaign microsite, with downloadable lesson plans and guides themed around the gardening campaign. We recommend setting up a dedicated microsite for your campaign to keep everything in one place. It’s great for explaining what your campaign is about and letting people know how they can get involved. Your campaign microsite should also have your social wall embedded so visitors can see their own and other people’s posts when browsing the site. 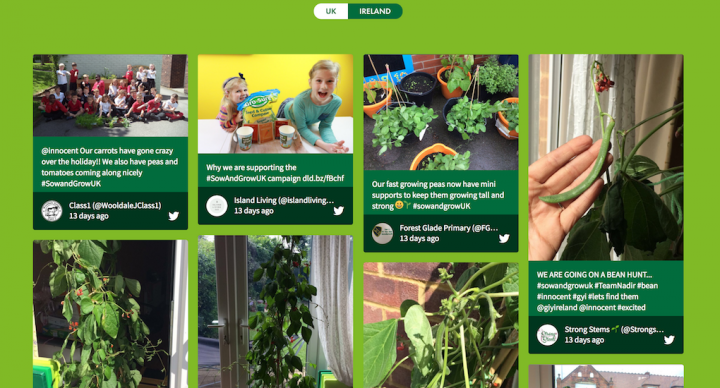 innocent used three separate hashtags throughout the campaign: #sowandgrowUK, #sowandgrowIE and #sowandgrowWinners. To manage and present the three hashtags, innocent set up three separate social media walls with a Walls.io Premium account. Sow and Grow UK social media wall. 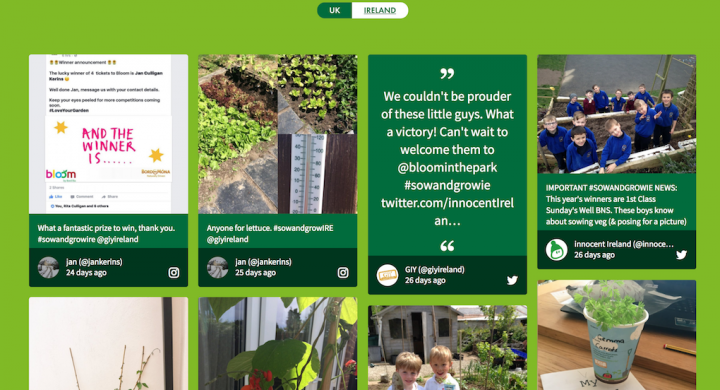 innocent embedded both the UK and Ireland social media walls — with a locale switcher — on the Sow & Grow microsite. A third and separate social wall was created to showcase the winners of the competition. With Walls.io Premium, you can set up and manage up to five different social media walls with just one account. No need for cumbersome switching back and forth because your account dashboard gives you access to all the walls you’ve set up. We wanted to know more about how the Sow & Grow team dealt with the three separate walls throughout the campaign, so we had a chat with the marketing folks at innocent and the team at Leo Burnett London, the agency who created the hashtag campaign for innocent. Why did you choose to set up three different social walls for your Sow and Grow campaign? The Sow and Grow campaign is taking place in the UK and Republic of Ireland so we wanted to have a separate Walls.io wall for each locale. The third wall we needed was for winning posts. We’ve embedded the walls on our campaign sites and we think they look great. To display posts on the different social walls you’ve also had to establish different hashtags for Ireland and the UK. How did you go about this when communicating the campaign? We published a resource booklet for Ireland and for the UK — each booklet had the relevant country’s hashtag in it. When speaking to participants in the UK we used the UK hashtag and in Ireland, we used the Irish hashtag. You’ve teamed up with GIY [Grow It Yourself Ireland] for this project and are displaying posts from their Facebook page on your social wall. How have you set this up? Walls.io has really powerful filtering functionality which made it a breeze to pinpoint GIY posts for inclusion in the walls. It’s great that, despite Facebook discontinuing crucial parts of their API, Walls.io is still able to collect Facebook posts. From the Walls.io dashboard: The Sow and Grow UK social wall fetches posts from the GIY Facebook page and filters for the UK-specific keyword #SowandGrowUK. The Irish wall filters for the Ireland-specific hashtags #SowandGrowIRE and #SowandGrowIE make sure that only posts about Sow and Grow Ireland are pulled from the GIY Facebook page. How did you handle someone using the “wrong” hashtag and a post-landing on the “wrong” wall? We manually approved the posts so we could move the post with the wrong hashtag to the right page if needed. Why did you choose Walls.io for your campaign? Walls.io was the obvious choice. It took minimal work to style it for our campaign and the moderation and admin panel is intuitive and fast. The innocent Sow & Grow campaign shows how much leeway using Walls.io Premium gives campaigns. Premium is especially useful for larger campaigns with different locales, allowing them to adapt their social walls exactly to what they need. Splitting what would ordinarily be just one social wall up into different locales or for different purposes creates order and makes it easier for users to interact with the campaign. The Sow & Grow campaign impressively managed to separate the social media walls to pinpoint them for each locale while still keeping everything firmly tied together with the campaign microsite. And thanks to all the additional information and resources available on the microsite, the site doesn’t become obsolete after the campaign has run its course. If you’re planning to create a multi-wall hashtag campaign, have a closer look at the innocent campaign and microsite and check out how our Premium plan can help you easily pull off even complicated campaigns.